Why mow the lawn yourself, when you can have a robot do it for you? Husqvarna have very kindly supplied me with an Automower 320, which is a mid-range robot lawnmower that’s suitable to mid to large size suburban gardens. Normally I like to focus on low-cost, DIY home automation projects, but this is just too good to pass up! In this episode I explain how the Automower works, how it’s different to a traditional manual mower, and (most importantly!) how my pets react to it. In future episodes I’m going to try some creative things with the Automower. I can’t go totally crazy because the mower is supplied by Husqvarna as part of a pilot program and I’m not allowed to open it or modify it (yet!) but there are still some fun things we can do without voiding the warranty or having it repossessed. Over the years I’ve slowly added individual IP cameras, both inside and outside the house. However, I’ve run into limitations such as how to store footage from the cameras for security purposes, and how to display multiple cameras simultaneously. I’ve used workarounds for these problems but it’s time to try out a proper camera system, rather than a collection of separate cameras. I installed an ANNKE system a DVR and cameras to replace 4 of my existing IP cameras, to test how well it works. I also installed long video cables and a wireless mouse so I could mount the DVR inside my ceiling and display the camera feed on a couple of LCD TVs, and tested BNC-to-UTP adapters to run Cat-5 cable to a distant camera. Unfortunately I discovered that the DVR requires Windows for network access, because it relies on a plug-in that doesn’t work on Mac or Linux. That means I had to run long video cables to the TVs that I use to display the live feed from the cameras. The end result is great, but it’s not how I intended to set it up. There are a bunch of other packages as well. The AUD price seems to vary: I think it’s generated by converting from USD at whatever the daily exchange rate is, so it’s different now to when I got mine. If you want to take your projects to the next level and add online capabilities this tutorial is for you. Although it is relatively simply to connect up a sensor to your Arduino and read sensor values onto an LCD or your serial monitor, making these sensor values accessible over the internet adds a whole new level of complexity! 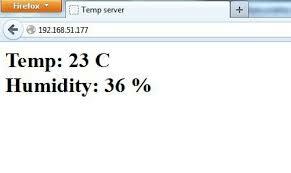 With this tutorial you can learn how to create your own online thermometer. To get started checkout the following link. If you are looking for a temperature sensor to use in this project the team at SuperHouse Automation recommends the Freetronics temperature sensor module. To find out more about check out the product page.